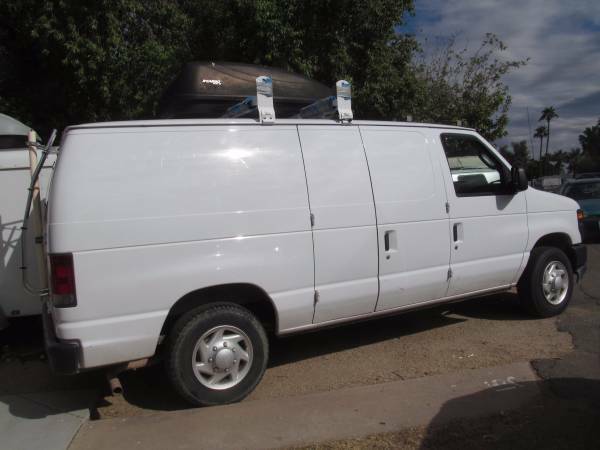 Ford E-150 Cargo Van, 2008. V-8 gas engine. 117K Miles. Runs and drives great. Power windows, power locks, power mirrors. Cold A/C, heater/defroster all work great. Solar and wind power wired with inverter, converter, and battery bank. Interior is semi-permanent camping set up (can easily be removed with no damage to interior) with electric hookup, propane, 3 burner stove, AC /DC fridge, water hookup, 7 gall. water tank, 7 gall. gray water tank, porta potti, shelving, cabinets, and cot. Roof rack for kayak or other gear, roof top cargo storage. Auxiliary battery system. Spare tire and rim. Self contained unit. Complete tow package and tow brake- can haul up to 5900 pounds. 4 new 10-ply tires. Awesome for weekend getaways, short term camping trips, or for use with trade shows, art shows, traveling merchant, etc. 135w solar panel and AirX marine/rv wind generator also available for additional cost, to complete the set-up. The solar panel wires into junction on roof, wind generator telescopes into the pvc pipe on the rear door and can be connected in a few minutes. Clean title. One owner. Serious inquiries only. If the listing is still up, the vehicle is still for sale. We accept cash and paypal transfer. Do not contact me with any "Give me your address so I can mail you a check and send someone to pick it up" nonsense. No trades. If you do not have cash in hand, ready to buy, do not call me. No financing available.